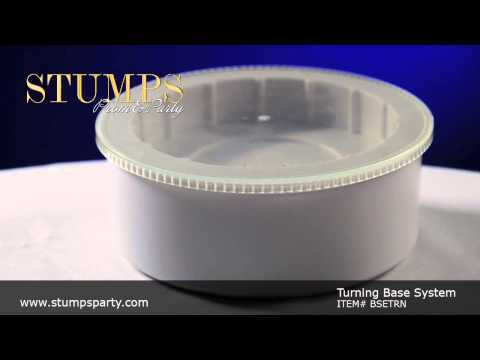 Bring your decorations to life with the Turning Base System! Our eye catching Turning Base System will give your decorations life with its rotating movement. Each inner base measures 8" in diameter x 3" high and operates at two speeds - 1 1/2 rpm and 2 1/2 rpm. The inner base is what revolves. This clear covered turning base holds up to 10 pounds and requires four AA batteries (not included). Give your tables, window displays, holiday decorations and more life for up to 12 hours with this one of a kind Our Turning Base System.